Starform Transparent Stickers: 3195, 3199, 3209. Starform Transparent Glitter Stickers: 1004. Paper: black, orange, green, cream. Place 4 flowers, 4 corners and a small bow on cream paper and cut out all stickers. Pierce the holes of the pre-printed pattern and embroider the stickers. Place a black square (7.5x7.5 cm) on the card with green strips (1 cm) along the sides, as shown. 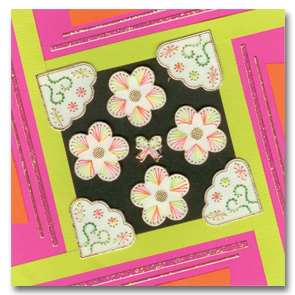 Stick the embroidered stickers on the card and use foam pads for the flowers. Decorate the card with orange strips and glitter borders.